With two architect parents I grew up in a particularly creative environment and trained at the prestigious St Martin’s School of Art in London. I worked in ‘own brand product development’ for many years, as well as in various buying roles for well-known retailers such as Liberty, Habitat and Boots. In later years I became Vice President of buying for Disney stores across Europe. I established the Sara Hughes brand in 2013 in Marlow when my upholstering hobby became a health hazard, with 15 or 16 lovingly reupholstered chairs stacked haphazardly in my bedroom! I adore art, innovation and creativity, which you can see reflected in my unique, distinctive collection of vintage and contemporary homeware and accessories, such as characterful solid wood pieces, gorgeous vintage Champagne saucers, decorated candlesticks and upcycled chairs. I also love textiles and hand-make all our contemporary and quirky lampshades. 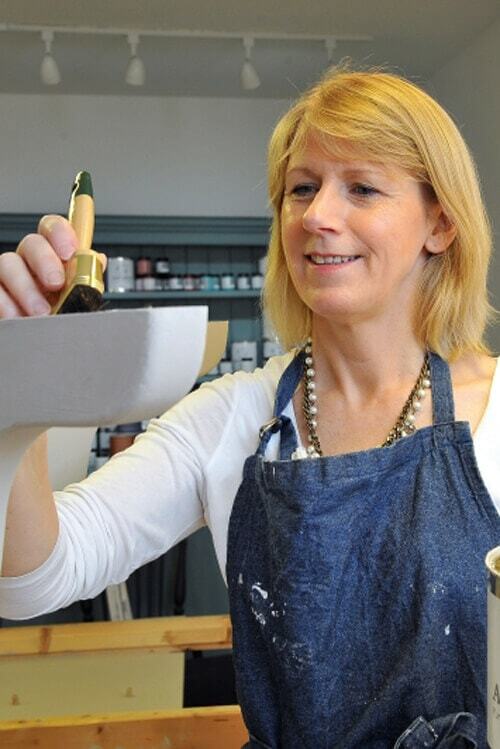 I trained with Autentico in the use of their fantastic paints - one of my favourite jobs is seeking out furniture specifically to transform into something beautifully painted and restyled for the shop. And I’m always spreading the word about the charm of vintage - you may have spotted me on TV in shows such as Put Your Money Where Your Mouth Is and Money for Nothing. Our customers often describe our shop as inspirational, which is what I’d always hoped it would be from the very early days when it was little more than a dream. So please take a look around our website and be inspired too! 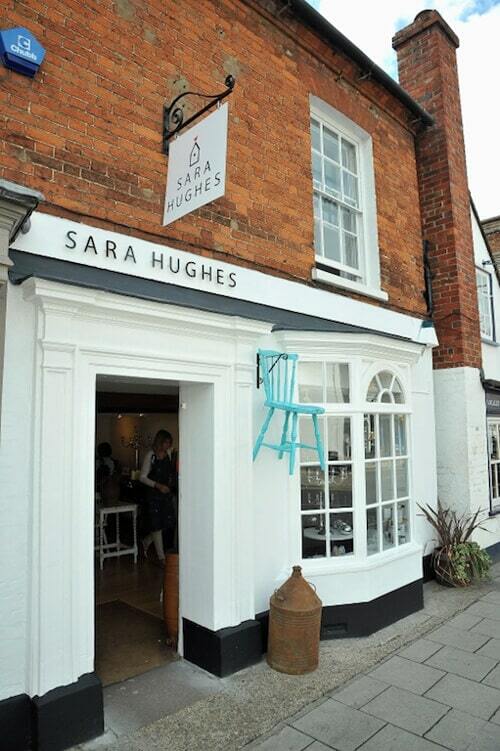 Sara Hughes is an independent retailer selling a stylish collection of vintage and new furniture, accessories and other homeware, both online and in our fabulous shop just off Marlow High Street. Our shop is a real treat for visitors, having been designed as a creative, relaxing shopping space for people to browse. At the rear is our workshop where we restore, refresh or restyle the beautiful treasures we have found. Visitors will often see our workshop ‘decorated’ with pieces of furniture at various stages of transformation. And at the front is our collection of eclectic and ever-changing vintage and modern pieces. Our varied and unique stock typically includes solid wood vintage furniture as well as retro curiosities, decorative finds, new and old prints, and fabulous lampshades handmade by Sara herself. We are also a destination store for Champagne saucers sourced from France and Belgium. And of course, there are our paints. As one of the biggest stockists of Autentico paints, we stock 100 colours in the Autentico Vintage range and 60 colours in the Versante Matt range, and can also order any colours not kept in store. Just ask! While we very much have our eye on interior design trends, we also like to think of ourselves as fresh and innovative, and hand-select our products based on their individual appeal and unique style. Our vintage items typically (though not exclusively) date from the first half of the 20th century, while our new, modern items include work by talented yet relatively unknown designers, as well as by more established artists such as Anna Wright and Jayne Ward. Please do pop along and see us. We’re open 6 days a week and love to welcome both new and existing customers. We’re friendly, knowledgeable, great at customer service (if we may say so ourselves) and you’ll always receive a warm welcome.